Whip the egg whites until stiff peaks form. Gradually add the sugar until the meringue is glossy and all the sugar has dissolved. Add cornflour and lemon juice. Pile the meringue onto a lined baking sheet, turn oven down to 120°C and bake for an hour until crisp. Place the sugar, yolks, butter and lemon juice in a saucepan and whisk over low heat until thickened. Stir in rose water and puréed strawberries and refrigerate until thick. Serve pavlova topped with whipped cream, curd and sprinkled with strawberries. 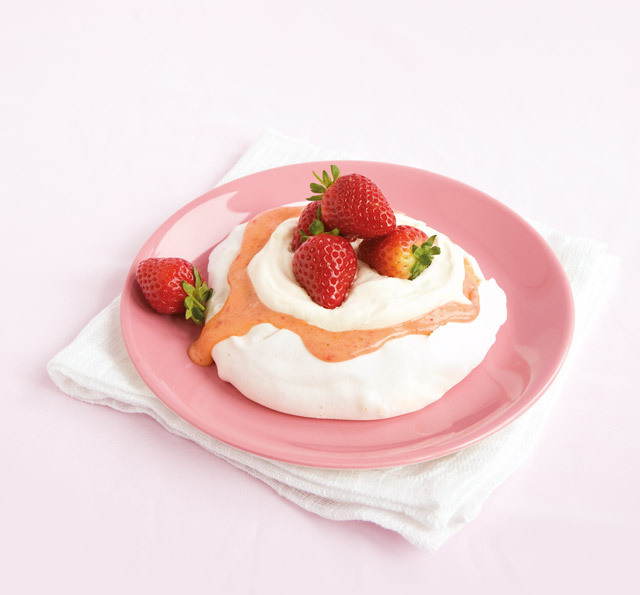 Unfilled, the pavlova can keep in an airtight container for up to 5 days.